Antoine de Kervern, a V.I.E. 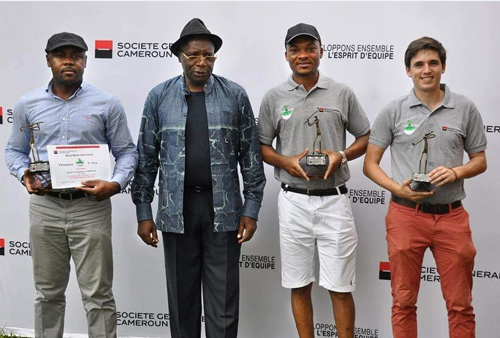 at AGS Yaoundé, finished in third position in the Société Générale Golf Open in Cameroon, a competition which brought together the best players around the country. Antoine de Kervern, a V.I.E. (International Volunteer in Enterprise) at AGS Movers Yaoundé recently won 3rd prize in the Golf Open Société Générale Cameroun at the Yaoundé golf course, in Cameroon. The tournament, which took place on 10 and 11 November 2018, was played over three series and brought together the best players around the country. He has really excelled on all fronts in Yaoundé amid a difficult commercial environment. He managed to take ownership of his position and is valued by all our customers in Yaoundé, which is very precious. Antoine is involved in many cultural and sporting activities in Yaoundé. As a guitarist he’s also part of a band that occasionally performs in the city and recently acted in an amateur play. Antoine is also an accomplished sportsman who practices football, hiking and, since his arrival at AGS, he has also taken up golf. The business development of the branch was the primary motivation behind the decision to take up golf but he got hooked and progressed quickly in the sport. Antoine can be proud of his achievement to be ranked third in the series in which 24 players participated. The V.I.E. opportunity at AGS Yaoundé has been an incredibly rich professional experience. I was quickly integrated into the team and was able to concentrate on networking and the commercial side of the business. I was also able to work on the reputation of AGS in Cameroon. Congratulations to Antoine on this outstanding accomplishment. We hope that he’ll keep his enthusiasm, and that he will continue to explore his talents while part of the AGS team.